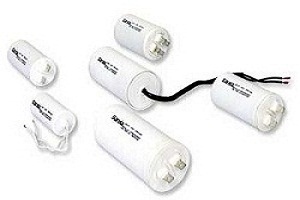 These Capacitors are light weight and compact in size have been designed keeping in view, the normal duty cycle present in various utilities. 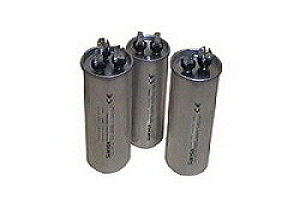 These Capacitors are used for almost constant loads having negligible variations. “SARDA” heavy duty power capacitors are specially designed to meet the requirements of varying loads in industries having higher over currents/voltages and also harmonics. In this design the out put of KVAr value remains the same however there is phenomenal reduction in stress per module as these modules are doubled and connected in series. 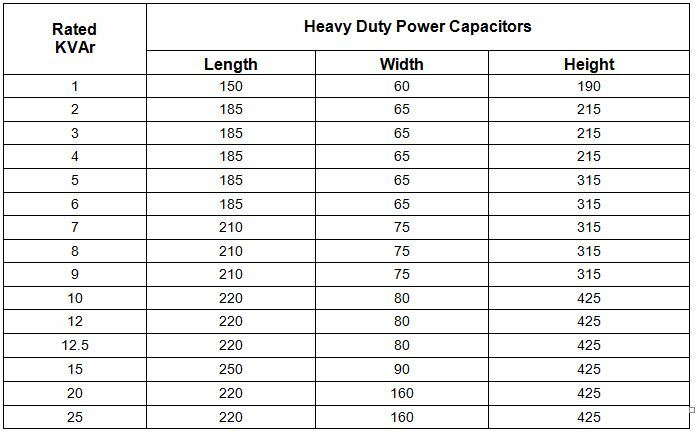 Heavy-duty power capacitors are meant to replace conveniently & cost effectively the conventional mixed dielectric/film-foil capacitors. These Capacitors have been designed to suit fluctuating load conditions and withstand over-voltage and over-currents within permissible limits. These Capacitors are stronger than standard type to withstand required dielectric stress which varies non-linearly. In rush current limiting inductor coils are used for longer life of Capacitors. Meet statutory requirement & avoid penalty. Advanced vapour coating techniques involving high degree of purity of metal, coupled with heavy edge gives added advantages to metallised Polypropylene film of self healing type to handle higher currents and withstand the electrical surges that are predominantly observed in the power systems. Effects of harmonic currents are minimized by using suitable filter networks in conjunction with these capacitors which can be supplied on specific request. Low energy consumption due to low watt i.e. 0.5 watt/KVAr. 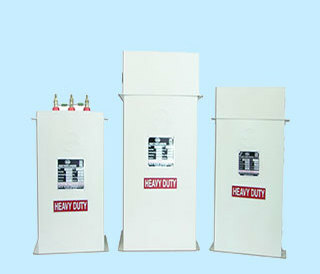 Higher insulation properties and temperature withstanding Capability. Modular design: For easy maintenance as the modules are replaceable. 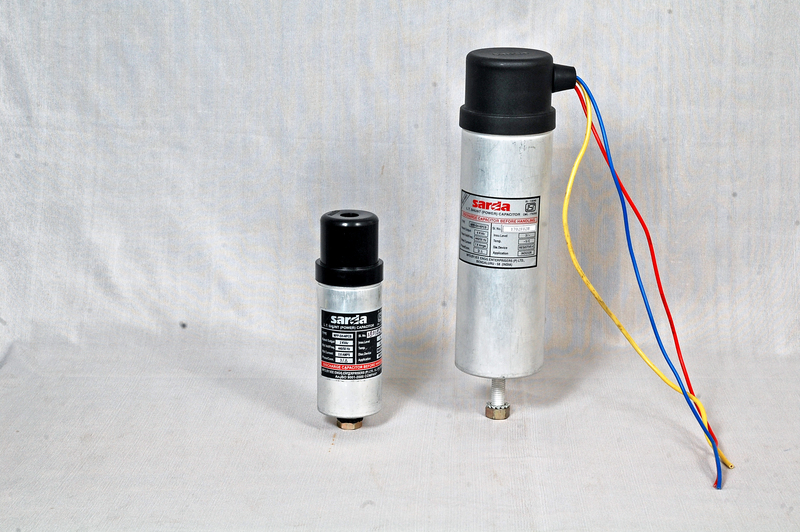 Explosion Proof Design: By using soft Epoxy / PU Resin, pressure developed due to any internal fault of the Capacitor will disconnect the electrical connection of the module and safe guard the nearby equipment. M. S Box (Housing) for Capacitor is provided with Louvers for free air ventilation thereby keeping operation temperature at lower levels and increasing life of the Capacitors. KVAr ratings are from 1 KVAr to 50 KVAr. Banking of KVAr units is also undertaken by us for higher KVAr rating requirements. Immediately after receipt please check the capacitor and ensure that they are in good condition without any external damages during transit. Please ensure that the capacitor terminals are tight & proper while connecting to the load. Any loose contact at the terminals may result in heating and premature failure of capacitors. Ensure proper grounding of capacitor before energising it. Check discharge resistors connected across the terminals are intact, capacitors must be discharged fully before handling it. Do not charge capacitor without discharge resistor. Energise the capacitor and measure voltage & current using a clamp meter in all the phases. Proper current rating MCB is recommended in order to avoid over current to the capacitor which may cause fire risk. Automatic switching of power capacitor in sequence shall be such that already energised capacitor shall have sufficient time delay circuit for discharge before it is subjected to another re-striking operation. This is an important aspect, which if proper care is not taken may result in over-voltage condition, increasing the risk of capacitor being subjected to high voltage stress level and there by the dielectric insulation breakdown. Harmonic distortions in electrical systems are commonly present in loads like thyristor controlled DC drives, rectifiers, arc welding machines, etc. Harmonic filters reduces harmonic distortion to avoid higher current across the capacitor terminals resulting in over heating the capacitor. Switch ‘off’ capacitors when inductive loads are not in use. Care must be taken to see that the capacitors shall not draw any current from the source which results in leading power factor which is not recommended since the reactive power compensation exceeds more than what is needed. When star delta starters for higher rating inductive motors are switched on, take care so that capacitors are switched on when motors are running in delta connection only. This can be done by making use of delay timer which can switch on the contactor and capacitor. Ensure proper rating of required KVAr is connected at load points. Adequate fuse ratings / cables switch gears shall be used. Firm fixing of capacitors along with cable lugs of appropriate size shall be used. Earthing should be done properly to avoid accidental leakage current. Repeated switching without sufficient time delay shall be avoided. Discharge resistors needs periodic checking in order to avoid shock hazards. Periodic checking of current in each phase is essential to keep track of capacitor condition. Switch off power capacitors under light load or no load conditions. All capacitors must be discharged before handling. 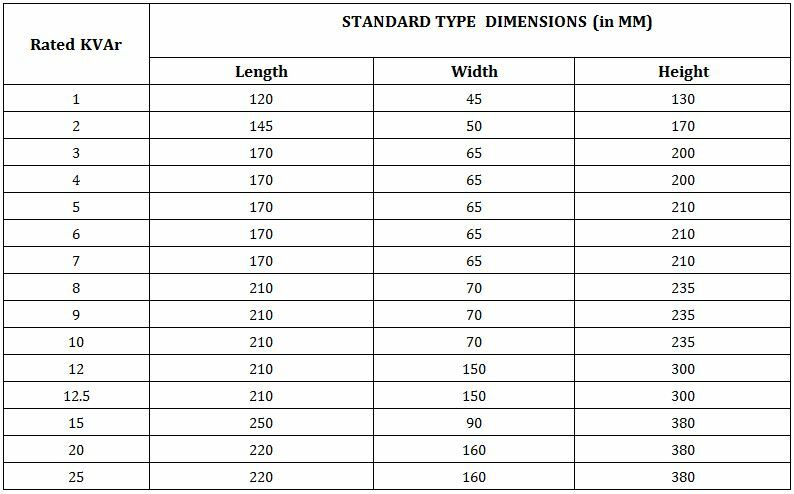 Recommended Capacitor rating for Direct Connection to Induction Motors. 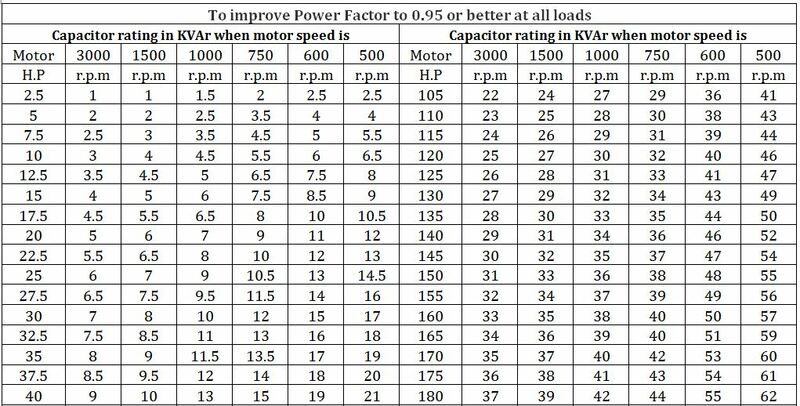 Capacitor rating in KVAr when motor speed is Capacitor rating in KVAr when motor speed is. 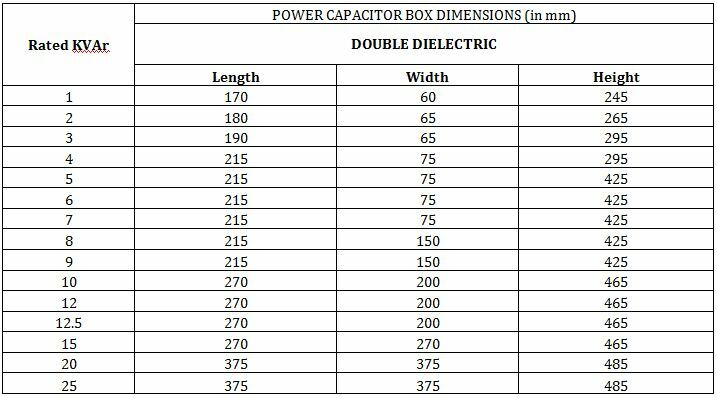 Multiplying Factor for Calculating the sizes of Capacitor for Power Factor Improvement. Aiming at replacing the conventional mixed dielectric oil type capacitors, our double dielectric type is designed to suit continuous operation for heavy duty application particularly where presence of harmonics plays a prominent role. These Capacitors are mechanically robust and electrically stable to withstand combined effects of thermal and electrical stresses prevalent in major industries. These types are absolutely necessary in industries with electrical systems having loads like heavy duty inductive motors with low rpm which includes respective switching mode of operation within short time duration. (Approx. 4 to 6 times in a minute). Electrical hoist motors used in heavy industries for lifting raw materials or semi processed materials where inching operation is done intermittently. Induction motors of 50Hp, 100 Hp, 200 Hp and the Capacitor must be of the above said type which can take care of switching surge currents / voltage spikes. It can take care of “Harmonic effect” if the Total Harmonic distortion is less than 5%. Heat dissipation is very low due to special design which protects the dielectric from high voltage / current levels. In places where non-linear load conditions of Electrical systems are prevailing these Capacitors will give best results compared to standard type capacitors. For Improvement of Power Factor in Electrical Installations having fixed normal duty inductive loads without variation. 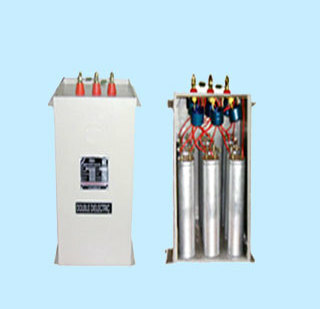 Manual Power Factor Correction Panels etc.